Joan E. Gadsby is recognized internationally as an authority, consultant, lecturer and public speaker on the responsible and informed use of benzodiazepines (tranquillizers and sleeping pills) and anti-depressants. 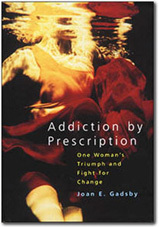 Gadsby received an Honourary PhD in Prescription Drug Addiction, Medical Research, Public Health and Promotion based on her previous academic studies, professional skills/experience, her 12 years of intensive research in this field and her internationally endorsed book "Addiction By Prescription: One Woman's Triumph and Fight for Change." Her PhD was granted by the Alternative Medicines Research with head office in the British Crown Colony of Gibraltar (whose mission is education, advocacy and research) and which is affiliated with the Open International University for Complementary and Alternative Medicines. The program is accredited by the American Naturopathic Medical Association, the American Alternative Medical Association, the American Association of Drugless Practitioners and recognized by the World Organization for Alternative Medicine. Joan received her Bachelor of Arts degree in Psychology, English and Journalism from the University of Western Ontario, and did post graduate studies in the MBA program at the University of British Columbia in Marketing and Industrial Relations. She is also Co Executive Producer and Research Consultant of the television documentary "Our Pill Epidemic: The Shocking Story of a Society Hooked on Drugs" which is available on video and for international broadcast. A former Marketing Executive with four of Canada's largest companies and a former poll-topping elected Councillor for 13 years in North Vancouver, she is President/Owner of Market Media International Corporation which provides consulting services in strategic marketing and planning, public affairs, government relations and issues management. 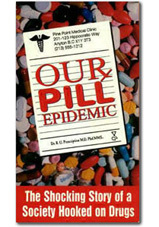 A Wellness and Health Promotion Consultant to international corporations, governments, healthcare organizations/individuals and for medical/legal issues on prescription drug addiction, Joan continues to make regular appearances on television, radio, the internet and through other media, in addition to speaking and lecturing at Universities, international/world conferences and at health and wellness shows on prescription drug addictions and mental health. In 1994, Joan was selected as one of Canada's notable women, by the Canadian University Women's Club and has served on the National Board of Women Entrepreneurs of Canada and is a member of the International Alliance of Professional and Executive Women and a long term member of the Vancouver Board of Trade. She is also Vice President of the International Benzodiazepine Awareness Network (BAN). She has many other professional/business affiliations and recognitions and has done extensive volunteer and community work. Her future projects include 2 film projects: a feature film/movie of the week based on her book "Addiction By Prescription" and an expanded international Television documentary to be filmed in 5 countries. This powerful documentary will investigate the shocking story of a world society hooked on drugs, the creation of drug-induced illnesses and a worldwide health care system that turns millions of unsuspecting men and women of all ages and children into "Accidental Addicts." The documentary will expose how prescription drug addiction to mind and mood altering drugs such as benzodiazepines (tranquillizers and sleeping pills) i.e. Valium, Librium, Dalmane, Serax, Xanax, Restoril, Ativan, Rivotril, and addiction to anti-depressants such as Paxil, Prozac, Zoloft and Effexor is far more gripping and debilitating than addiction to heroin or cocaine and a much bigger and more insidious problem affecting more people worldwide than illegal drugs. The program will reveal the promotional and marketing strategies of the multi billion dollar pharmaceutical industry, the high socio-economic costs associated with prescription drug addiction, class action lawsuits, personal stories of the "walking wounded," worldwide research and the roles of international organizations including the World Health Organization and the United Nations. An active mother and a classic car and convertible enthusiast, Joan enjoys regular running, nature photography, music, travel, reading, and fashion designing.